Blog - Calgary Property Management | Emerald Management & Realty Ltd.Calgary Property Management | Emerald Management & Realty Ltd.
Our wishes for you this Easter. on Sunday, April 21st for Easter Sunday. A property manager is on-call to assist with any emergencies and can be reached at 403-237-8600. Regular business hours resume Monday, April 22, 2019. Emerald Management & Realty Ltd. is proud of its insurance program that has been customized for the properties we proudly manage. Many owners and condominium corporations opt into this inclusive program which is guided by the experts at Lloyd Sadd Insurance Brokers Ltd. Recently there has been a shift in the insurance market and the Emerald team has been working aggressively on behalf of its clients to mitigate the financial impact from the changes in the market place. The following is provided to give some insight in the work happening behind the scenes to maximize results. 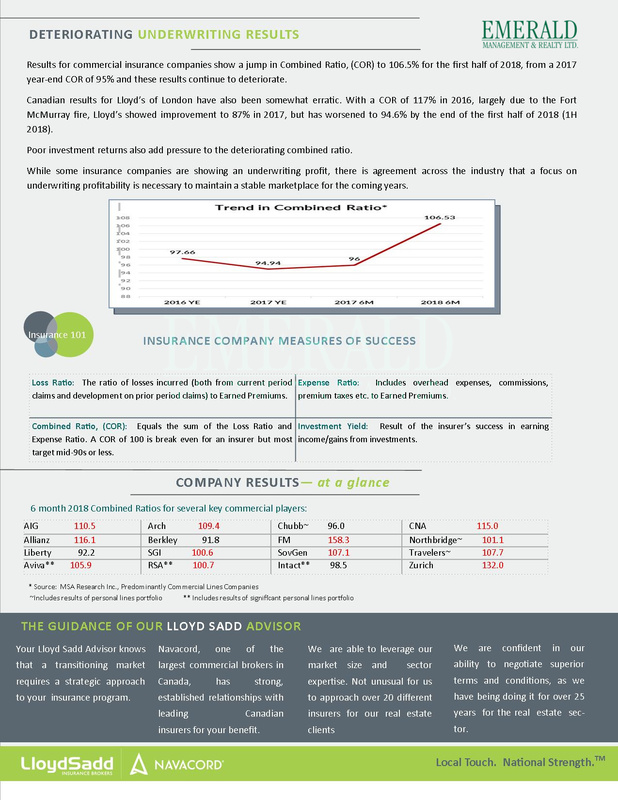 Trends for the past couple years have been deteriorating with the underwriting and claims experienced. Poor investment returns by insurance companies have added pressure to the cost of insurance in the market place. This has also resulted in some insurance companies exiting the property management insurance sector. Despite some profitability being shown by some insurance companies, the industry as a whole appears to have come to agreement and currently focusing on underwriting profitability for a stable insurance marketplace. 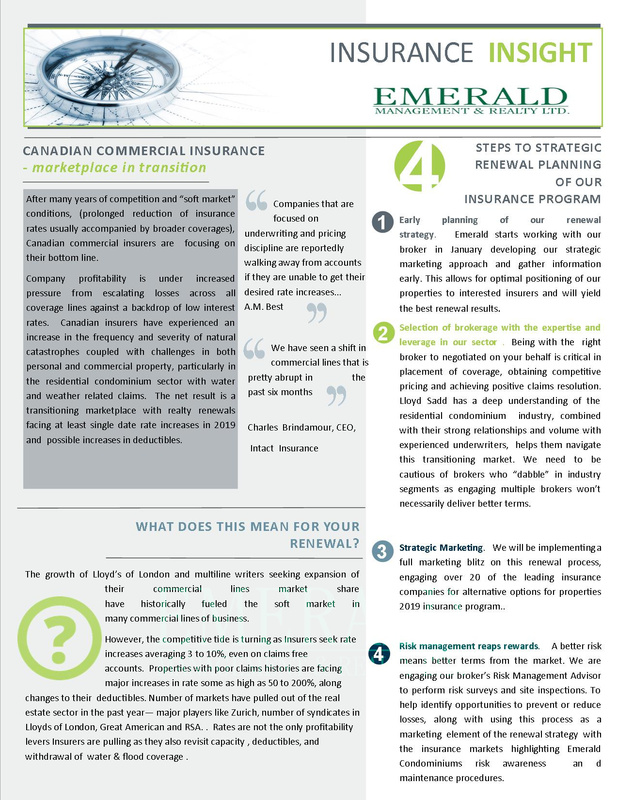 In response to the recent changes that started being experienced late 2018, Emerald’s triggered the negociation process of its master insurance program and has been working with our independent broker, Lloyd Sadd Insurance Brokers to aggressively seek the best coverage and pricing in the market place. Further, we are ensuring that coverage is placed with financially sound insurers with expertise in our property management sector that are known for excellent claims service. Further to these changes around the insurance environment, Emerald continues to work on behalf of its clients to minimize the impact of this shift on pricing to maintain the benefits of our insurance program. We continue to be focused on achieving the advantage of our low corporate rates, reasonable deductible levels, prompt claims management, rental revenue loss coverage, vacancy coverage … and more. To discuss the Emerald Management & Realty Ltd. insurance program advantage and any concerns you have with your current property coverage please contact our team. Having tenant insurance is an important part of any tenancy. Tenant insurance will ensure the security of the tenant’s property in case of any unintentional harm to the property or to a guest visiting the property. This could be essential in covering significant costs in case an insured loss occurs. Further, proof of and maintaining tenant insurance is an important obligation under Emerald Management & Realty Ltd.’s residential tenancy leases. In accordance with our lease agreement and the Residential Tenancy Act, the tenant is legally responsible for any damage they may cause to any part of the building or people in it. For example, if a toaster becomes faulty and starts a fire, that could cause damage to the unit, but also to the building. If this happens, the cost of the damages could be the responsibility of the tenant. These types of events quickly become very costly and exactly the reason tenant insurance is required as it could save the tenant from having to pay a large sum of money in repairs and damages (and/or liability to others and the property). Another simple reason for needing tenant insurance is that the tenant’s belongings aren’t covered by the building’s insurance policy. If you think: “Well, I don’t own that much, so I’m not worried about it; I don’t need to get it,” its important to know that emergency repairs add up quickly and if you don’t have insurance, you also won’t be covered for additional living expenses if you have to be out of your home for even a day … or longer. Expenses add up quickly. If you are a client of Emerald Management & Realty Ltd., and unsure where to even start looking for Insurance … we can help! We have partnered with Nuera Insurance so that our tenants can get the best coverage at preferred rates. To find out more about tenant insurance, visit our website here or contact our office at 403-237-8600 and ask for information about our discount code with Nuera. Rachel and Josh have been the Resident Managers of Lincoln, Diplomat and the White House for over eight years. Emerald Management & Realty Ltd. was proudly engaged to provide property management services for this real estate portfolio just over two years ago. Since then, the Emerald Team has enjoyed working with Rachel and Josh. Most importantly, their welcoming spirit and helpful support during the implementation of improvements, is much enjoyed by everyone. Further, their efforts are reflected in the multiple long term tenancies at the properties and the personal touches around the buildings. Rachel will go the extra mile to advocate for her tenants and takes special interest in getting to know each tenant personally. The positive feedback about Rachel and Josh from residents is highly valued. Emerald is truly lucky to have such a friendly and hard working couple to oversee these buildings. Congratulations and Thank You Rachel and Josh for all your efforts!